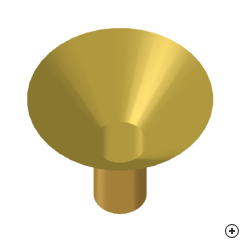 Image of the Waveguide-fed Conical Horn. The conical horn antenna is a practical microwave antenna, often used as a feed for communication / satellite dishes and radio telescopes. Although the axial symmetry makes it capable of handling any polarisation of the exciting fundamental (TE11) mode, the pin-fed horn design provided here is for linearly polarisation. 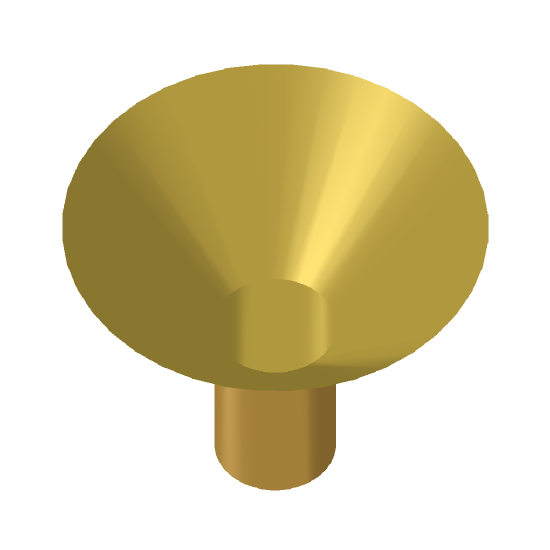 There are a number of permutations on the basic horn design which can serve to minimise the effects of diffractions, improve pattern symmetry and reduce the sidelobe levels. These include corrugating the internal walls, curving the walls at the aperture, incorporating corrugations with the wall curvature at the aperture, and introducing higher order modes in the horn to reduce the field at the aperture edges. A lens is often placed across the aperture to compensate for phase error and thus narrow the beamwidth.